I just can’t seem to get enough time to sit down and write, so while this won’t be intellectually stimulating or deep and meaningful, it will serve to record some of the moments of our weeks. Let’s see. . .
1. Little has become facinated with cars as of late. She is very aware of the fact we drive a Ford and she will pick out Fords as we drive down the highway. The Cummings drive a Kia (as do the Cowans) and so we are made aware of the passing Kias as well. Then there’s the Lexus and the Honda which have letters on their fronts. It isn’t rare to hear a little voice pipe up from the back of the van with, “There’s a Ford F150. That’s so silly.” I actually heard myself telling my oldest daughter, “Guess what! They just opened a new Kia store down the street from Walgreens. I thought of you would like that.” Once I realized what I’d said (and Little calmed down from the excitement) I shook my head. My life. . .
2. Just yesterday the discussion in our van turned to the children’s’ futures and what they “wanted to be I grow up”. I have to say it was fun to be a part of this conversation since it isn’t something we hear a lot about. Bubba started off, “I’m going to be an astronaut!” KB chipped in with, “I’m going to be a doctor!” (This is a diversion from the usual choice of baker. It makes me wonder what happened to change her mind. She’s back to baker now.) Lastly, Little piped up with, “I want to be a driver.” Figures. Little: “Baby G’s last name is Cowan. There’s G Cowan and V Cowan and M Cowan and Mr. Cowan and. .
4. Tomorrow is our wedding anniversary. Yep. 11/11/11 and we have been married 11 years. Maybe Jesus will come back. It feels like something big should happen. Instead, the workshop I agreed to speak at on Nov. 4 was moved to Nov. 11. I have an IEP for Bubba (Rebecca don’t forget). Honey has work, of course. And I am in charge of snack for Bubba’s class and have nothing in hand as of right now (9:30PM). I have to admit that a part of me feels that it’s only right for our day to spent this way. . . a day to celebrate our life together is a day of fast paced activity bordering on chaos. . . it’s a miniature of our life together. 5. Little wants a new messenger for Christmas. Remember the Barbie one she got. . . a year or two ago, anyway, remember how it lasted a few months and died? I was so glad to see it go and she is just committed to the idea that she needs another one. AND she wants to buy a new Leap Frog messenger too; one just like what she has but the newer version (it’s blue with a yellow power button) and she plans to give Bubba her old one. She is tired of waiting for me to get it for her and has announced that she’s going to buy one with her money the next time we go to the store. I’m ready to throw my hands up and surrender. I am not sure how to teach someone (that God made like He made Little) about stewardship and the redundancy of purchasing what she already has. . . I’m just going to invoke the “we don’t buy ourselves things the month before Christmas” rule and see if she still wants it after she gets what I know she is getting. Good grief. 6. 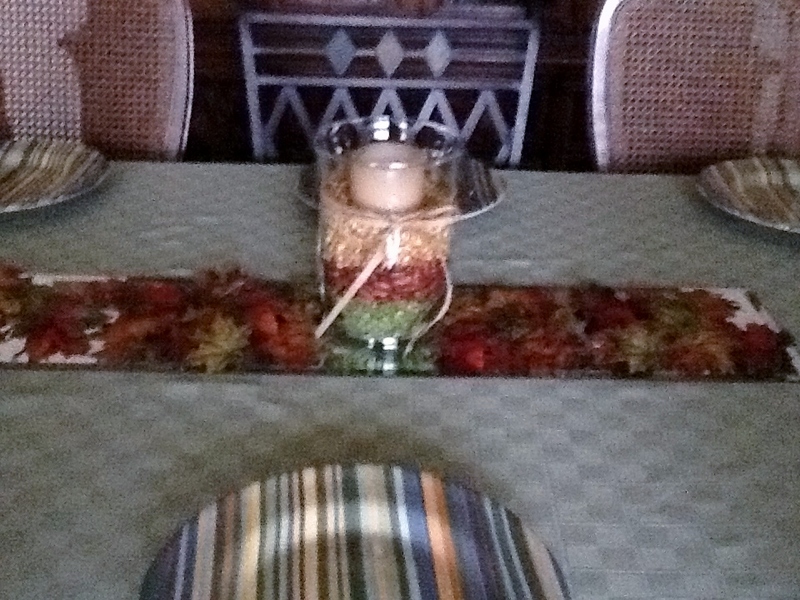 My mom made a centerpiece using an example I sent her from Pinterest. SO FUN!! I think it turned out so cute. I’m proud of my mom – joining the Pinterest band wagon. 7. We are 50 days from the end of 2011. Seriously. I was thinking about pulling out the reading list I made in January, seeing what I’ve read compared to what I said I wanted to read, and then, instead of flogging myself, remember that God is a God of grace and mercy and that mercy is new every morning. Great is HIS faithfulness. I REALLY hope it means that Jesus is coming!!! That would be nice! X has been an observer of cars for some time now, maybe his fascination wore off on Little. By the way, he thinks every Lexus goes crossover goes with B. and every white Ford minivan must be you guys! He’ll have everyone’s license plates memorized before long and end his confusion. He also wants to grow up and be a “wace car dwiber” He and Little might just be two peas in a pod! Happy anniversary tomorrow! I saw a post on the Disney Fairytale Wedding FB page that they have 11 couples getting married tomorrow at Disney World. What are the odds that 11 couples would marry in the same spot on 11/11/11?? You’ve been missed :). Sounds like lots of busy going on! Hope you have a wonderful anniversary–any clam chowder tonight? I love the centerpiece your mom made. I think I will have to pin that, too. Maybe I can actually make it next year :). love this post. everything about it. love the conversations, the moments captured. love that though we sometimes want to throw our hands up (& pull our hair out), we will want these moments back….even the challenging ones….won’t we? 😉 in the meantime, i’m going to try not to blink. oh, and your tempting me to jump on this pinterest band wagon, too!! love the centerpiece.